Welcome to University at Buffalo School of Law’s Climate Change Blog! Welcome one and all. This is the blog for SUNY Buffalo Law School’s climate change class and our climate change delegation. We are a delegation of 10 students (and 1 professor) observing the climate change negotiations in at COP 24 in Katowice, Poland. We represent the State University of New York and work with Islands First . Those students (plus the instructor again) are blogging and vlogging and using all kinds of social media options to share their experience. I got to the conference around 8:30am this morning to confirm our meeting room reservation (they’ve been shifting unexpectedly) before our 9am briefing. At the briefing we heard that after a late night Thursday progress was looking pretty good, with just a few sticking points and some contentious parties. There was almost nothing on the schedule but the plenary meeting at noon. By mid-morning, it had been rescheduled for 3pm. There was an address by the Secretary General to observers, but we were not able to attend. It was scheduled in a smallish room and seats had filled up quickly. UN Security staff advised us that there would be no standing section due to security concerns. The doors to the plenary room open about fifteen minutes before the scheduled start, and we usually enter around then to get a seat. Most events at the COP are on a tight schedule and begin and end promptly, but we have learned that large meetings like the plenaries and the stocktakings tended not to begin until at least half an hour after the scheduled start. Observers and parties milled about, waiting for the presidency to enter. Around 3:45pm, a lone woman came across the stage, stepped to the podium, and announced that the plenary had been rescheduled for 7pm. This news was greeted with frustrated but good-natured laughter, and attendees filed out to find some way to kill time for the next few hours. Shortly before 7pm we returned to the plenary. After finding our seats, we began to hear the rumors fly that the plenary would again be rescheduled. Some said 10pm, others had heard midnight. Sure enough, a UN Security guard entered and advised us all that the plenary would now be held at 10pm. At this point only myself, Colton Kells, and Professor Owley were still in the venue. We were lucky enough to get a quick hallway briefing from one of our insiders. Work was still progressing, and would likely go late into the night. It was very possible the 10pm plenary would be moved again, or that it would end up being a brief update and an announcement that work would reconvene in the morning. We decided to head up the street to find dinner and plan our next move. While at dinner, update messages began to fly. First rumor was that the plenary would not be held before 2am. An hour or so later, the new text was estimated to be released at 4am followed by consultations. Another hour passed and we heard it was sure to be a text at 1am, a plenary at 4am, and closing plenary at 11am, but not to come back for the 4am because it was likely to be rescheduled and the building was nearly empty. Half an hour later that reversed. There was a push for the finish line, lots of people aimed to be back at 4am for a plenary and the COP would close by 8am. The UN finally updated their schedule, confirming this information: plenary at 4:30am, closing statements from 6am-8am. We caught a late train back to Gliwice to get ourselves re-centered. As I write this, its just past 1am here. I’m sitting at my computer with cold pizza and a warm beer (there’s nowhere in town to find a cup of coffee at this hour) and one eye on my phone waiting for updates on the expected 1am text. I’m checking train timetables and Uber availability, trying to plan to get back to the venue a little before 4am, assuming the schedule holds. The COP is in overtime, but it looks like we all might win. Further live updates will be posted on Twitter (@ColinKnoer) and a final update on the close of the conference will be posted here after I’ve crashed and recovered from this marathon. This is only a taste of what the negotiating teams have been going through, but there is a strange energy and excitement that comes with following the COP to its final conclusion. The highs, the lows, the drama; its been quite a week and quite a day, and if all goes well the next several hours it will all have been worth it. Stay tuned. Today is education day at the COP, and many school groups and youth organizations are slotted to give presentations. One event, “Climate Action Starts At School,” highlighted a competition between local primary schools to create and implement climate conscious programming in their communities. The competition was sponsored by IKEA and others. The competition was based on the language of Article 12 of the Paris Agreement, which states: “Parties shall cooperate in taking measures, as appropriate, to enhance climate change education, training, public awareness, public participation and public access to information. . .” It is clear that these schools and their students took this challenge to heart. They all developed comprehensive programs to address all aspects of Article 12. After hearing the presentations from each school, I’m sure it will be hard for the competition organizers to narrow it down further. The representatives from each school outlined how they planned to attack climate change and waste management issues in their schools, homes, and communities. Each program has unique features, but most schools focused on four main issues; water conservation, waste collection, energy usage, and sustainable gardening and biodiversity. These students have designed programs that aim to educate themselves, their families, and their communities about these issues. They seek to create climate conscious “habits,” and solidify sustainable practices as a mainstay from now on. Students will be responsible for tracking water and energy use in their homes, and consolidating this data with their classmates. They will then educate their families and community members about best practices, and then conduct a re-assessment later in the year. Public School No. 27, for example, is encouraging students to ride bikes to school, if they can, rather than getting rides from their parents. Also, Public School No. 19 will post water conservation best practices in school bathrooms, in order to promote less water usage. Most schools are looking to step-up their waste collection game, which includes collecting and sorting various waste materials within their schools and in their wider communities. Students would like to see increased recycling efforts, and are taking upon themselves to make it happen. Public School No. 51 plans to collect rainwater in order to offset water usage. Further, all five schools will collect food waste, and will compost the food to be used in their gardens. Speaking of gardens… each school plans on improving or creating public gardens at their schools. Using composted food waste as fertilizer, these students will reduce the need for chemical alternatives. This reduces the cost of the program, and prevents the use of harmful chemicals. Primary School No. 1 believes their garden will be the envy of all others. Although, I believe they will have some stiff competition. All of these schools will educate and inform their communities through workshops, presentations, and even marches. These students think it is very important to engage their community members in these ways to facilitate a more concerted effort. Public School No. 28 has written many poems to serve as slogans during march, which their presenter assured us are very, very good. These schools believe, because they cannot act globally, they should affect as much change locally as they can. What these students may not realize, however, is that their enthusiasm and dedication is evident to all of us. Their efforts should serve as a inspiration and motivation globally, and hopefully more schools and youth organizations will follow their lead. After the presentation, IKEA served their new vegetarian hot dogs. IKEA claims that the carbon footprint for their veggie dogs is up to 7x less than that of traditional hot dogs. While I’ve never tried they’re famous meatballs, I’m sure these hot dogs would give them a run for their money. Ok…so how does this all actually work? Today has been fairly quiet so far for those of us who aren’t part of the key negotiating delegations. I’m going to take a quick break to talk about exactly how all this work at the COP is supposed to translate into a real solution to climate change. Our contact at AOSIS gave us another great briefing this morning. On top of some interesting commentary on how the negotiations function, predictions for the next 36 hours, and identifying a few key parties that might be bearing a lot of influence, we got a quick breakdown on how this is all supposed to actually function. We were presented with a flowchart. 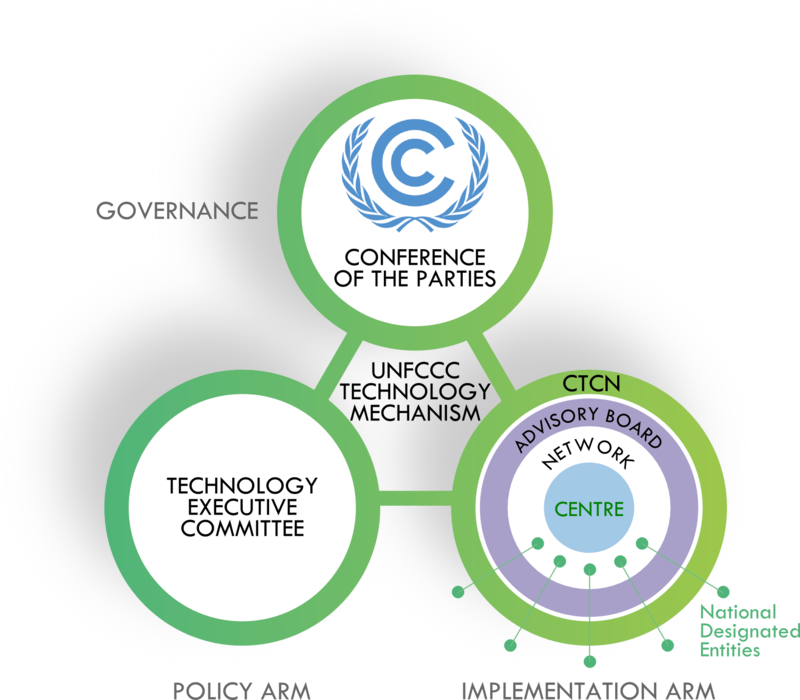 At the top is the UNFCCC: all the work done this week, at the past 23 COPs, and generally among the parties. The results, things like the Kyoto Protocol or Copenhagen Accord or the Paris Agreement, are then supposed to influence national policies. The intent is that parties will return to their home countries and pass policies and legislation that will allow the party to meet its obligations. This translates into three key categories: deploying technology, changing behavior, and enhancing sinks. Deploying technology refers mostly to the implementation of green energy: wind, solar, hydropower, and others. It also means carbon-free or carbon-light transport, such as electric vehicles and improved mass transit, and energy-efficient building techniques or appliances, from lightbulbs to washing machines. Parties can support technology development through policies that subsidize innovation, incentivize adoption, or penalize continued use of obsolete technology. Changing behavior looks to reduce consumption overall. It can be as simple as turning off lights and unplugging power draining appliances, or embracing improved technology by using LEDs or energy-smart appliances. These can be accomplished through marketing and messaging, or through incentives. Changing behavior might also be a matter of social design. For example, a city might focus urban planning measures on improving access to mass transit and making their communities more walkable or bike-friendly. Enhancing sinks is all about finding ways to get the carbon that is produced out of the atmosphere. The greatest sink we have available is forests. By reducing deforestation, and increasing the planting of new trees, we can increase the rate of removal of carbon from the atmosphere. The next step is finding ways to use mature trees in ways that will not result in a re-release, such as for building material or by burning wood as fuel but capturing and storing the released carbon. It is important to understand that these steps after the COP concludes are essential to achieving real results. Whatever agreements are reached at the end of this week, or at the end of any COP, do not produce real change unless they are implemented by parties and their citizens. When we go home, the real work is just beginning. On an individual, societal, and political level we must constantly strive to create the concrete effects that will lead us into a greener and more sustainable future for the earth and humankind. On this day in 2000, Al Gore conceded the presidency to George W. Bush after a series of legal battles over the infamous hanging chads. I was only in 1st grade at the time, and honestly did not have a clue about who Al Gore was, or what he believed in. The only thing I can actually remember about him then was that my teacher told us she would vote for him because he had a nice smile. Unfortunately for her though, he did not come out on top. However he was not truly defeated. Instead he has continued to fight and become a champion for climate change. Yesterday, I had the chance to see Al Gore’s smile in person, and hear firsthand what he had to say about the climate change issue. He showed shocking images of a woman stranded in the middle of mud and water, desperately attempting to free herself. This was accompanied by startling statistics, such as the fact that enough fossil fuels are emitted each day to equal 500,000 Hiroshima bombings. There was a video of an orangutan fighting against the machine that was attempting to destroy his home. Pictures of hurricanes, snowstorms and heatwaves followed one after the other. Throughout this slideshow the room was filled with depression. How had we allowed things to get this bad? Even more pressing was the question, have we gone too far to turn back? After filling the room with dread and despair, Gore finished his presentation with success stories. Of countries that were able to cut back their emissions by switching to clean energy. Of people marching in the streets against administrations that refused to acknowledge the issue. He urged us all to not give up hope yet, but to continue fighting for a just result. While I do think that he had the intended effect he hoped to have on the public watching his presentation, I am not sure if he had any effect at all on the people who are in the position to actually make change. The negotiations will end this week, but what effect will they truly have? Mother nature’s ticking time bomb is bound to set off at any moment, but top negotiators seem to be more concerned with words and brackets. It is not like they are not aware of climate change, or are strangers to the science. Everyone today has some knowledge about the impending doom on our front steps, but that does not seem to be enough. These thoughts left me discouraged about the process, and doubtful that the COP will ever be able to defeat climate change. I had thought Paris would be the solution, but how can it be when the United States, a major emitter, is unwilling to accept its conditions? After thinking about all of this, I went to bed last night unsure that this process could be meaningful, but that all changed today. Every day I receive an email from the History Channel titled “This Day in History”, and today’s just so happened to be the day Gore conceded to Bush. He lost the fight for the presidency, and it is disheartening to imagine what the world would be like today if he had won. However, he has not given up, and 18 years later is still making himself heard. Gore has continued to bring climate change to the table, reminding us again and again of the terrible disasters that are occurring, and will occur if we do not act. While this may seem repetitive, I think that it is necessary. His presentations do not change, because WE have not changed. 18 years later and countries are continuing to emit harmful fossil fuels in to the air, some even more than before. If this continues, Gore’s presentations will only get scarier. I am sure that he would love nothing more than to write a book about the fight that was won, but until that day comes he will continue to speak about the horrors, which is quite remarkable. I find him to be inspiring because he has not backed down once, despite the many setbacks and criticisms he has faced. Champions for the environment across the globe need to continue to speak about climate change, and urge policymakers to agree on a solution that saves this planet. Even though it may seem that the COP is not effective today, that does not mean that it will not be effective at some point in time. The only time when we have been defeated at the COP is when we have failed to mention the reason why we are here. Those images of people suffering need to be in the back of everyone’s minds when drafting policy initiatives if there can be hope to create something that is worthwhile. So even though Gore often has the same story to say, it may be that someone hearing that story will one day be sitting in a closed meeting about important negotiations. That person could be the one to kick start change, and we must not forget the presentation that sparked their fire. Thus, I applaud Gore for not losing his voice after all these years, and hope that he never does until the entire world understands why he has not. Last night’s stocktaking was an important turning point in the COP. As we have already reported, the presidency has taken over the drafting of final language for the ministers to review, debate, revise, and adopt. With minimal bracketing, this document is supposed to allow the ministers to get out of the weeds and focus on the key disagreements that need to be ironed out by the end of the week. The reactions we heard last night were harsh. Even before the meeting began we heard rumblings of bad news coming, and parties discussing how they might be able to get time on the floor to speak. There was similar dismay after the meeting. Overheard in the hallways were lamentations that the presidency was giving up too soon and too easily, frustration that the parties would not continue their work, and questions of whether Poland should be in charge at all. This morning, we had the opportunity to meet separately with two experts who have been involved in these talks for years. One works with an NGO and the other works directly for the government of a party on the negotiating team (I will leave them anonymous, as their work this week is ongoing). We asked about what the stocktaking meant, and about the reactions we heard. Both experts told us that the announcement came as no surprise. The normal course of action is for the presidency to take over in the second week, so the extension of the deadline to Tuesday at 5pm was really bonus time for the initial negotiations. The stocktaking announcement did change the dynamic of the continuing work. While the parties spent the last week and a half in large meeting groups discussing the positions to be taken and the language to be used, we were told today that many people will just be sitting and waiting. At times, when there comes work to be done, they will be rushing to do it. But instead of marathon group sessions, it will be a variety of small sprints. We were advised to pay attention to the crowd. Updates on the new drafts will go directly to the parties, but news of what is occurring will trickle down to the rest of us. Both predicted that further stocktakings should be expected the next few evenings. These will be important and potentially contentious events and should keep us informed on the progress being made towards a final agreement. The experts did differ on their predictions for this evening. One expected that some groups will be pulling an all-nighter tonight. The other disagreed, but noted that the close of the conference is likely to push into Saturday, and that Friday night is certainly going to be a late one. We learned a few other things about the process. The plans for the negotiations began months ago. The first step is internal, as parties work to determine their initial positions. These decisions often must go through executive or legislative branches of government, until the negotiating agency has an approved course of action. Next, the parties negotiate among their negotiating groups. These caucuses are groups of similarly-minded countries. Examples include the Like-Minded Developing Countries, the G77, and the Umbrella group (made up mostly of those countries not identifying with any other specific group). After months of conference calls, the groups determine their shared positions from which they will negotiate with combined power. When the parties finally reach the COP all of this groundwork has already been laid. This puts the parties in good position to begin negotiations among all the parties in the group sessions that we have attended. There is an additional level beyond that, full of bilateral discussions, huddles, late night phone calls and backroom deals. That type of work is sure to accelerate now as the issues narrow and the stakes rise. A very interesting comment was that there are likely a thousand people in the building who think that they were the linchpin in the Paris Agreement, that something they did or some position they pushed for was key to the passage and adoption. I think that this clearly reflects the type of ego that comes with getting involved in politics. But it also demonstrates the cooperative nature of these talks. I think that each of those people likely were key to the Paris Agreement, just not the key. For negotiations this complex, there are a multitude of necessary but not sufficient conditions. We can only accomplish these lofty goals when we work together, even when sometimes it feels more adversarial. I sat in on the second part of the High Level Segment today. Parties were given the opportunity to make a national statement to the plenary. This was the event closest to what I expected from a UN conference. In a large room, with conference leaders at the front, representatives of parties and others sat in rows in front of microphones and small signs with the name of their country or NGO. I sat in the rear, with my headphones streaming the translation. I heard a number of different translators. Presumably they tag in and out as the speakers change, passing the microphone to someone who can translate from the speaker’s language to the listener’s language. I took an opportunity to flip through the ten channels available. Sometimes several of the channels were just streaming the speaker’s audio, which I took to mean that there was no available translator that spoke both the language on the stage and the language for that channel. The daily programme noted that the statements would be ongoing without a break in order to fit in all of the parties who had yet to speak. Each party had three minutes, and the time limit was to be strictly enforced. This was not the case. No speaker that I saw spoke for under three minutes; Yemen went nearly ten, and Nicaragua for almost twelve. There were a number of different positions taken. Since this is about national statements, and not negotiation, parties had more freedom to push their positions without compromise. Most began with an expression of gratitude for Poland. Many talked about their nations accomplishments and plans. Some told stories and anecdotes or fables, illustrating the effects of climate change. Another frequent refrain was a call for action, a reminder that we have precious little time, and that our hope is in our own hands. Nicaragua made some very interesting statements. The speaker referenced the lawsuits against US tobacco companies, holding them responsible for the health costs imposed by their products that they knew about, had the science to understand, and hid from the public. He compared this to the conduct of oil companies who have long been aware of the dangers of fossil fuels. He closed his statement with a warning: should we be afraid of intelligent alien contact with the human race? No, we should be afraid that they came, they saw us, and they found no intelligent life on Earth. EDIT: I returned to the plenary this evening and happened to catch the United States addressing the assembly. I was disappointed to hear significant focus on economic expansion, fossil fuels, rejection of regulation, and reiteration of the Trump administration’s intention to withdraw from the Paris Agreement. I left after that statement, and observed chuckling and eye-rolling from other attendees leaving as well. Decentralized Autonomous Organization Integral Platform for Climate Initiatives (DAO IPCI) provides a universal public blockchain infrastructure for carbon markets, green bonds, renewable energy credits, and other environmental market assets, rights and liabilities. A blockchain is a growing list of records, called blocks, which are linked using cryptography. Each block contains a cryptographic hash of the previous block, a timestamp, and transaction data. It is an open, distributed ledger that can record transactions between parties efficiently and in a verifiable and permanent way. To further illustrate, imagine a spreadsheet that is duplicated several times across a network of computers. Then, imagine this network is designed to recurrently update this spreadsheet. Information held on a blockchain subsists as a shared, and repeatedly squared, database used as a beneficial method for sharing information. cultivated blockchainization of corporate, regional, national and international environmental programs. There are several benefits to utilizing the blockchaining technology in order to help reach Paris Agreement goals. Decentralization allows information, once put into the blockchain, to be stored and distributed without change. An unprecedented amount of trust is built by absolute traceability on every stage of supply chain. Blockchain transactions allow easy global access as they can be viewed and access from any device across the globe. Intermediaries are avoided by eliminating the role of settlement and registration entities, utilizing direct p2p access to climate access instead. DAO IPCI’s aim is to unite fragmented green finance markets into a global ecosystem, making them more accessible, efficient, and transparent. Green to Scale is part of the Nordic Prime Ministers’ initiative Nordic Solutions to Global Challenges. It is a study with the purpose of analyzing the potential of scaling up existing climate solutions, going further than current national commitments. No new technologies or innovations, just what is already currently known and used. Green to Scale applies also applies. The Green to Scale study looked at Estonia, Latvia, Lithuania, Poland, and Ukraine. It analyzed the emission reduction potential and costs of scaling up 10 proven climate solutions from Nordic and other countries. The 10 proven climate solutions included combined heat and power, wind power, solar power, energy efficiency in industry, electric vehicles, transport biofuels, energy efficiency in buildings, bioenergy for heating, reforestation and land restoration, and manure management. Per the results of the study, the 10 climate solutions have the potential to cut emissions by 13%, compared to the projected 2030 emissions of the five targeted countries if the existing measures were used. This equates to the potential to cut emissions by 149 (CO2E) in 2030. Improving energy efficiency offered the most potential. Efficiency measures in buildings would cut emissions by 53 Mt and efficiency in industry by another 25 Mt in 2030. When evaluating both costs and savings, implementing the solutions would save money over time as well. The next saving for the combined five countries in 2030 could potentially be as much as 1.2 billion euros. Other benefits include cutting air pollution and health impacts, creating jobs, improving energy security, and providing income and tax revenue. However, some barriers could hold back these solutions. Common factors would be large investment costs, lack of financing, weak carbon pricing, and lack of awareness and skills. On the third day of COP24, I am starting to develop some habits. Every day I fill up on the delicious breakfast buffet at the hotel. The group then struggles to get to the convention on time, and I enjoy my trip with short Pokemon session on my Nintendo Switch. There is no better part of my morning, however, than picking up my daily chocolate fix from the volunteers from Plant for the Planet. You can find their smiling faces just after you get through security with arms stretched out, offering every attendee a sizable slab of creamy milk chocolate. All they kindly ask is that I read the message inside the wrapper, which I have enjoyed reading every morning as I enjoy my chocolaty second breakfast. On the inside of the wrapper, you can find more information on Plant for the Planet and their mission. Plant for the Planet describes themselves as an “independent and non-profit children and youth initiative.” There goal is to plant 1 trillion trees in an effort to reduce the amount of carbon building up in our atmosphere. Trees act as a carbon sink, and Plant for Trees estimates that another trillion trees planted could capture 25% of anthropogenic carbon emissions. Plant for the Planet is mainly driven by its children members, who have been motivated to take immediate action to ensure their environmental future while adults seem to waste time talking about solutions while accomplishing very little. This organization is another great example of the world’s youth taking their futures into their own hands, and another role model for older generations. While the chocolates are given out for free at the COP, they are also sold in Germany and Austria. All of the manufacturers and distributors have foregone their profits, and the money is instead being used for reforestation projects and education. More information on the organization can be found by clicking the link above. As Jordan’s post from yesterday explains, COP President, Michał Kurtyka, is not very satisfied with progress made so far at this year’s COP. During his remarks, he stated that he did not believe any further progress could be made using the current negotiation strategies. After attending two of the Informal Consultations on linkages between the Technology Mechanism and the Financial Mechanism of the Convention, it is pretty clear that the President is not completely off the mark. The Financial Mechanism is operated by the GEF and the GCF, and is meant to provide financial assistance to developing countries. The parties have established specialty funds to help fund activities of developing countries in response to climate change. The linkage between these two mechanisms is important to ensure that new technologies and projects that will benefit developing countries are properly funded and can be transferred to them. The specific guidance and “rules” for this linkage can be found in the document produced by COP Agenda Item 8(b) (see the link below for all of the documents produced thus far. As you can see, the document is fairly short; barely more than a page. However, the parties seem to be able to argue over so few words for days on end. On Monday and Tuesday, Cory and I (Jordan joined us on Tuesday) attended two informal consultations on the matter. Both sessions lasted one hour, and were lightly guided by the facilitators. More or less, however, parties were able to raise their placards for a chance to speak. The first consultation was more focused on thematic issues with the document. Many developing countries took issues with any language about “conclusion”, for example, as they saw this as a starting point, and wanted to see the agenda item maintained through implementation, not just after laying the ground work. Some other countries wanted to expand the scope of some terms; Some countries, for example, wanted to see the scope of the document expanded past “accelerators and incubators” and focus more broadly on implementation. Other countries, like the U.S. for example, were far more dismissive, and concerned with stripping down the document to the strictly necessary; often recommending that whole paragraphs be cut, citing their being addressed by other agenda items. While these consultations were meant to finish last week, they were extended through Tuesday at 5:00 p.m. This created an odd atmosphere for the second day. Many countries were still unhappy with the changes made to the document following the consultations from Monday, and the facilitators were very reluctant to hear concerns unless it was accompanied by specific text recommendations. It was clear, however, that any newly proposed language was not likely to be agreed upon by all of the parties. Therefore, it seemed premature to narrow the consultation in this way. At the same time, however, the facilitators were very concerned with the upcoming deadline. Despite their efforts to limit the discussion, much of the comments seemed to be verbatim repetitions from comments made the day before, and were not usually accompanied by recommendations for new text. While I cannot say whether every informal consultation was as unproductive as this one, it seems likely from the President’s comments last night. Admittedly, I was not able to make the meeting this morning, but I would expect it is much of the same.